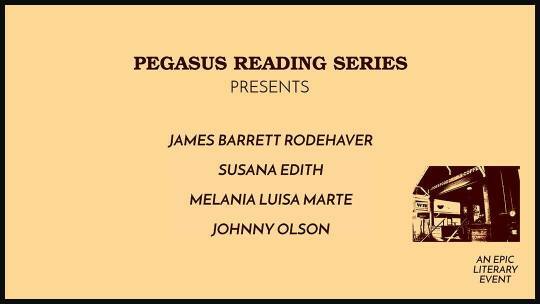 Pegasus Reading Series is pleased to debut at The Wild Detectives for a monthly series showcasing writers in the North Texas area and beyond. Doors open at 7PM and show starts at 7:30PM. This month, Courtney Marie and Sebastian Paramo bring you James Barrett Rodehaver, author of Time Travel For Daydreamers (Cringe-Worthy Poets Collective Press), which includes illustrations by Nadia Wolnisty; Susana Edith, founder of Lucha Dallas, a queer POC poetry collective; Melania Luisa Marte, Dallas Poetry Slam team member; and Johnny Olson, co-founder of MadSwirl, a Dallas-based literary magazine and open mike series. Born in Mexico and raised in New York. SUSANA EDITH now finds herself exploring the scenes of Dallas, where she has worked collectively with other POC artists to create a space where their voices are truly heard. Much of her work explores the realities and conditions of her self exploration of what it means to be a brown mujer both in the POC community and outside it. She is a founder of Lucha Dallas. MELANIA-LUISA MARTE is a first generation American. Her work explores many subjects including her afro-latina roots, culture and love/dating as a modern day feminist. She represented Dallas in the 2016 Women of The World Poetry Slam Competition. She is also a member of the 2017 Dallas Poetry Slam Team currently ranking 5th in the nation. She is a poet, writer and founder of GetFreeStayWoke, A movement centered on intersectional feminism, self-love and resistance. To learn more, follow her on Instagram at @feministmami. JOHNNY OLSON was born in Chicago, Illinois. After surviving a brief, yet violent war (Desert Storm) as a United States Marine, he hung up his cammies and rifle to instead grab his pen and notepad where he found his passion for writing. In 1998 he found himself in Dallas, Texas, where what was supposed to be a brief stint in the South turned into a decade and a half…and counting. In 1999, Johnny, with a couple of other mad cohorts, started Mad Swirl. He now serves at the chief editor, webmaster, and host at Mad Swirl’s monthly Open Mic night.